Yep, there's snow there. I'm right now running a world gen tool with our world from the server generating the world from -4000 -4000 to 4000 4000 and will post a map for everyone to look over. Taking a while to force the chunks to generate but I will get it posted once it's done. 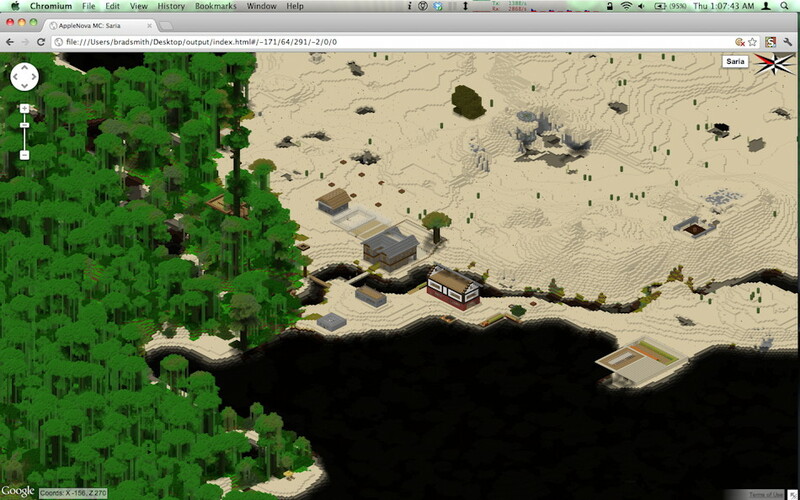 It will be a top down overview map with no flags autodisplayed. So If you all want to wait until the map is posted then you can make a plan for how to access the snow biome I'm thinking this would be best for all. However, I'm ok with you guys playing as you wish about this. Nether as the access isn't bad, though the map is coming to allow you to plan it out. Last edited by turtle : 2011-12-03 at 23:45. I'm thinking the Nether would probably be the best idea - shortest transit distance, plus the server wouldn't need to generate everything in the overworld between our current settlements and the local portal, keeping map size reasonable. I've just updated the map to a new release from the developer. This update brings the compass to point "true north" now. It's rendering now and should be up once the render is complete. Likely this will be around 10:30 pm Eastern. So map north and game north are the same now? Sweet! Well be. If you look at the map right now the compass will point to the left while the image actually maps the world to the path of the sun/moon from East to West. Crap, I think I just missed a setting when I started this render. Might have to re-render the map again after this one finishes. I didn't think how it might impact the angle of the map, I was just thinking of the compass. So the maps are working great with the new update and even display with the correct orientation. However, the coloring is totally different right now so I'm removing the current map and rendering a whole new map. Let's see how this works. Final map for TerraNova is up on Lenny. Please view with discretion as it is on the game server. I followed that link and it TOTALLY didn't work!!! I think all of us would benefit from a new map to find where everyone is and land claims. It's not perfect, but could we as an interim go with Brad's option or the now Anvil compliant Overviewer (Example). Overviewer is exactly what I used in my example screenshot. I'm working on a map using Overviewer now. I'll post if it gets done tonight but not expecting it will. I'm dealing with other stuff right now, but making this happen for you guys. Map is up at the usual location. Enjoy. FYI, not looking good for the original map program I was using. Seems the coders is done playing though *might* do an Anvil update. So I'm going to look more into Overviewer. For now I'm using it but manually running it every night. Well, most every night. I'll build a script for it and study the config file to make some customizations more like we like it. Really looking to get an overhead view we all like. New maps as of the 6pm backup are up too BTW. Trying two directions and a night mode now with the new map program. Sad part is I'm using the PC version because it's easier to get running. I'll figure out getting it running on my Mac or in a Linux VM later so I can automate it again. Really, I'm holding out hoping the guy who wrote the one we were using comes back and updates for Anvil. Plus, I got a lot going on right now. Check later tonight for two directions plus night. New maps are up but permissions need fixing. By the time most of you see this it will have been done. Enjoy and good night. So, it looks like I might be able to do Points of Interest with this map program. From what I'm reading we can use one symbol and in a certain line. I'm thinking we should use ~ and only from the first line of the sign. What are the thoughts of everyone who uses them? What symbol would you ilk me to try using and which line would you like the be the line parsed for being converted to a POI? I have a plea for you guys: Please do not travel in Nether and pop up a portal at random. As you can see from the map there are an odd number of areas where the world has just popped up. I'm currently narrowing down those chunks and pruning, but please be sure you wan't putting a portal up in Nether unless you've counted out where it's going to lead. Could it be a weird side effect of the compass warping? I'm not sure, but aside from a bug or portal, can't really explain how it would happen. 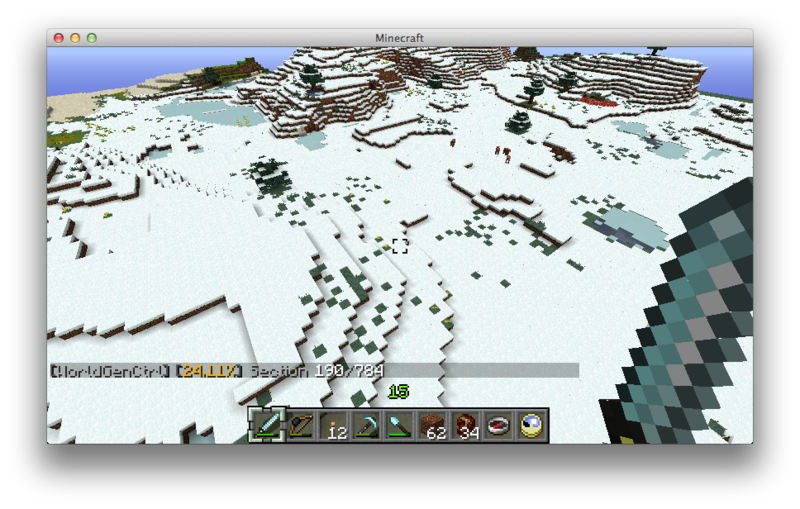 Still, not likely due to compass warping since you can't warp to anywhere you can't see with it. Just FYI, I'm about to prune any chunk that is only 12k-16k in size. Most chunks are 1-5M in size for comparison's sake. This is likely going to effect no one. I will keep the files though, just moving them out of the world so they won't be there. If you have something on the edge of our known world and it's now gone after I finish this, let me know and we can find it to put it back. Pretty sure it's a bug. There are no portals on any of the areas that popped up, and as Bryson says, they're far too small to be player-made. So glad it's a bug. At least we know why it's happening. I didn't think you could make a new portal to the overworld from the nether anyway!!?? FYI, the pruning seems to have worked as I hoped it would. Nothing seems to be missing but the odd chunks. Enjoy the map! Changing things up with my systems making the maps has caused me to have to run the maps completely over again. Taking forever. Lots of expansion East though. How about going West more.